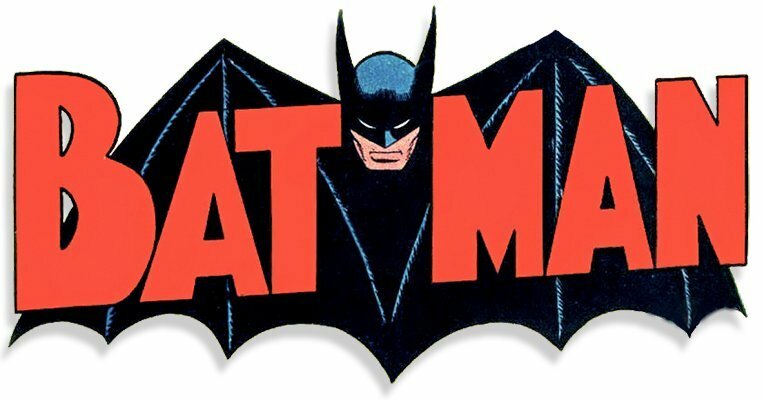 I have compiled a list of the most important and highest regarded Batman #ComicEssentials. Every week you can follow along as we take a look at new installments. 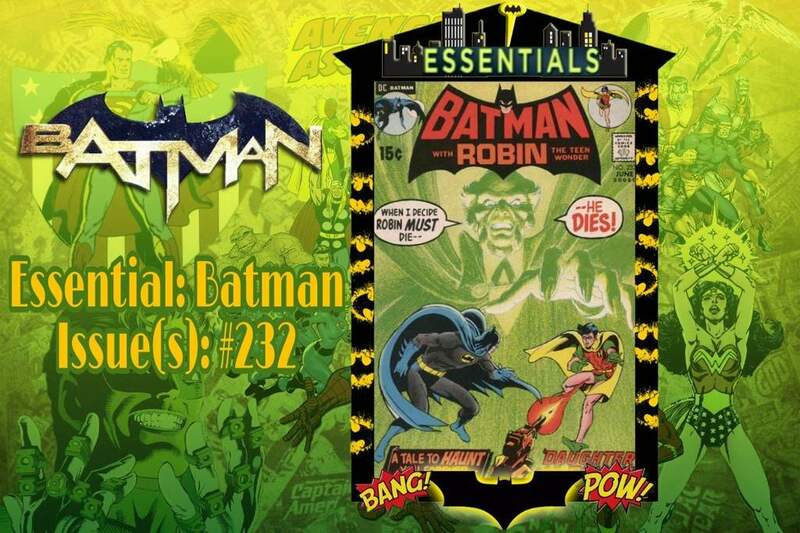 This week we are delving into a debut of (in my opinion) Batman’s second archenemy. Read until the end to find out what we’ll cover next. Gives us plenty of time to read. 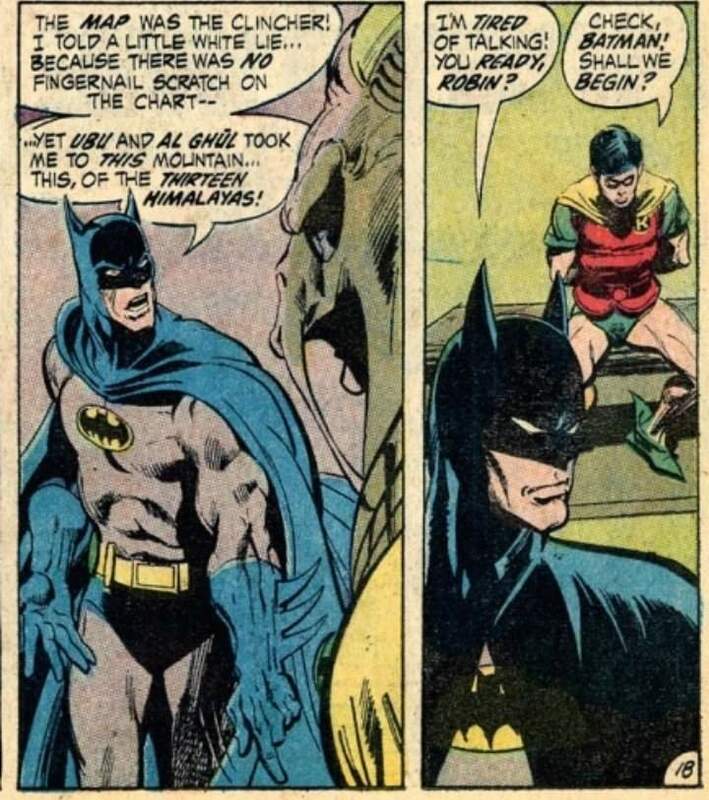 Bruce gets a letter with a picture of Robin beat up and captured. A scan of the letter and picture is needed, but he hasn’t yet upgraded so he has to go back to his former base of operations, Wayne Mansion and the Batcave. In Batman #217 which we covered last week saw the hero move out of the place so seeing him react negatively to the place was a nice moment. But he isn’t alone in the Batcave. 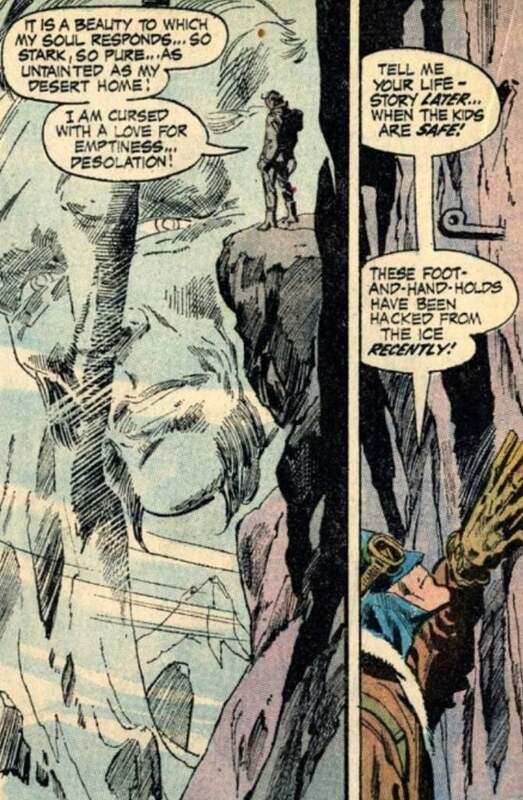 Somebody broke in, that person being Ra’s al Ghul! He quickly shows himself to be a threat when he easily exposes the identity of Batman. 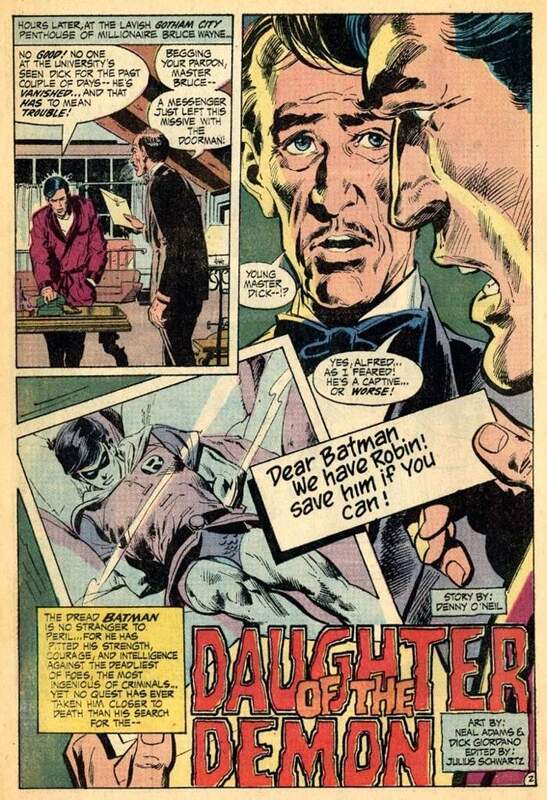 He’s here because his daughter, Talia (who Bruce already met) has also been kidnapped. Bruce scans the messages and picks up bits of a herb used in in far Eastern cult of killers (geez). They’re called the Brotherhood of the Demon located in Calcutta, India. Broke into my top secret cave and discovered my top secret identity? Sure! Let’s team up! In the city, Bruce has to beat up some street thugs to gain information of the cult’s residence. This moment apexes Ra’s potential, mystery and the fact he doesn’t shut up while monologing. A second longer and he would’ve started singing ‘Let It Go’. Suddenly a sniper is onto them! 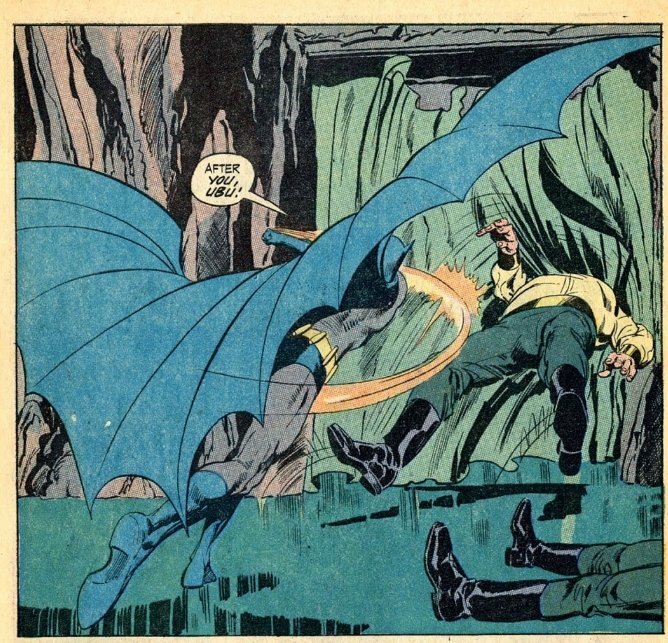 Ra’s al Ghul’s man gets shot while Batman plunges at the shooter. He spots a black smoke, a helicopter flies above him. The World’s Greatest Detective has something figured out. He moves past the guards with guns as if they were nobodies. Walks into the cave, sees the captured Robin with a bunch of cultists and funny enough throws out some quips that feel pretty natural to the character and in the scene. And boom! The Dynamic Duo starts fighting. It was such a great scene, felt like I was watching a cartoon. Bronze Age really revolutionized the industry in writing and drawing. If you’ve been reading along with me you’ll see the huge leaps and bounds the industry has made to improve. Next up we get even more super shots by Adams. That baby hand is unproportionally creepy! Reminds me too much of Deadpool’s movie. Finally Ra’s comes out with Talia. The villain is impressed, but one question still remains unanswered. “WHY? !” Well, it turns out Ra’s is considering to retire and he’s looking for a worthy successor, that candidate being the Batman. So you know, his son-in-law! Whatahtat?! That’s a cool reveal, one I didn’t even expect to be brought up by Ra’s until later down his history, not in his first appearance. It’s a great cliffhanger, but there is one major problem: that’s it. What do I mean by this? I checked the next issue and it’s a completely different story. O’Neil leads us to believe Batman said no and goes on to his regular, but it would’ve been nice seeing such an important part conclude. STORY: A Batman story with top notch dialogue and pacing. The story structure is great until the narrative decides to end at a climax. This might’ve been done purposefully to capture an effect, but it didn’t work for me personally. One thing the writing succeeds in the most is becoming a title actually trying to tell something exciting, new and never done before. 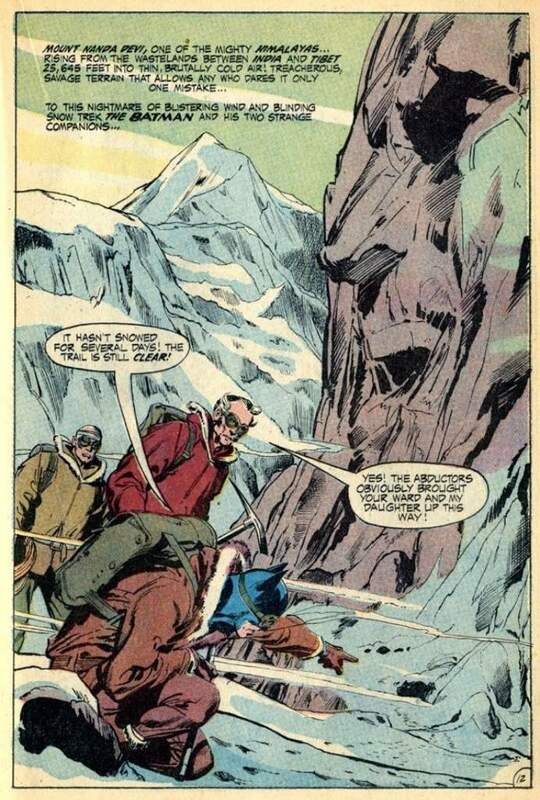 ART: Neal Adams is a master. If you compare his art to another penciler at the time you will come to a conclusion this guy is ahead of his time. He also shaped what the standard Batman should look like. More imposing, with less bat-like details on the ears. There was a minor slip up with the micro-hand which I have to take into account, but the whole issue is filled with iconic images I’d see many creators wanna adapt. ACTION: Just awesome work done all across the board. This category doesn’t only give out points for fighting, but whether the story introduces factors that keep the reader interested and even at the edge of their roof. Whether it’s a scene with the leopard or on the mountain peek I am invested which is something great action should do. 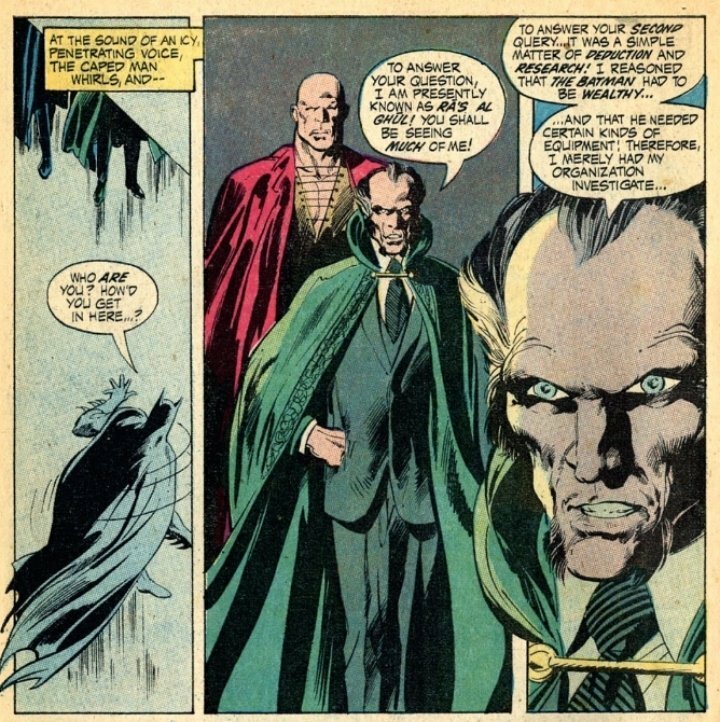 CHARACTERS: Ra’s al Ghul quickly established himself to be a major threat who can figure out Batman’s secret identity and test the man in ways never done before. His mini-monologue is testament to good writing and how much we can find out about the villain despite only being given a limited amount of information. Reading this gave me an impression al Ghul is somebody you do not wanna mess with because his nature and experience may destroy you. On the opposite spectrum we have Batman who is badass and fearless. 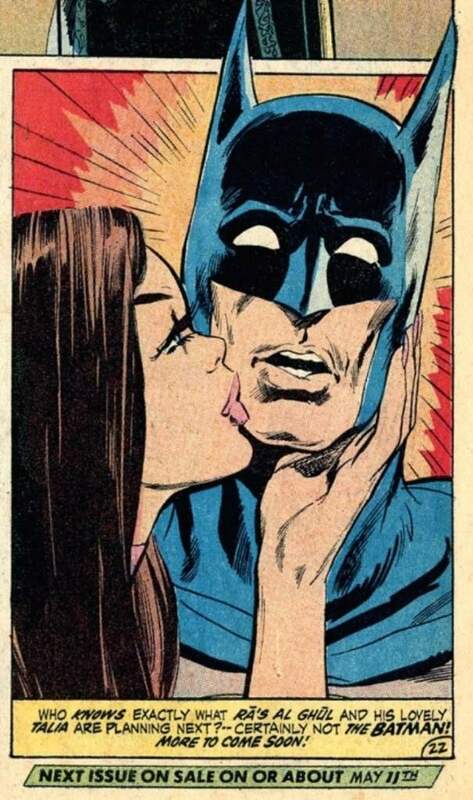 Everything I love about Batman is pretty much here. The very first Batman story I recommend to you without hesitation. The (beautiful) cover does spoil a bit about the plot and the structure may be slightly missing a proper ending nometheless, the reader is provided with a story that hasn’t been told before by mixing in mystery with a bit of supernatural. The presentation and execution hits all cylinders so, if you wanna read a classic, more than just a debut of an ‘x’ character, then this is for you. This is going to be a very specific one.^ It’s going to be very, very specific. Did I mention specific? Nowadays a story like this would probably take four or five issues to unfold. Perhaps the Batman stories by O’Neil & Adams are rushed at times, but they certainly feel consequential and important. I read this and the other early stories with Ra’s Al Ghul & Talia in the trade paperback Tales of the Demon, which I definitely recommend.